INMARSAT-C Mobile Tracking Service. > What is GlobeInfos ? 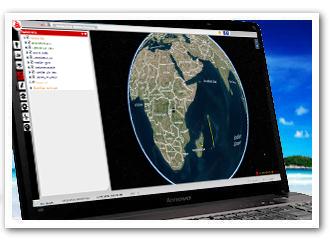 GlobeInfos is a near real time application that provides an accurate map and allows users to track each of their vessels or vehicles equipped with INMARSAT-C and mini –C transceivers from brands SAILOR or FURUNO. To use this service you must be a registered user. To do this, simply send us an email at the following address: activations@satairtime.com. A technician will contact you as soon as possible in order to obtain the necessary technical information concerning your transceiver. Setting up a mobile tracking is quick, it depends only on the remote configuration made by our team after your registration confirmed. We participate actively in the fight against spam and our servers are secure. We will never communicate to a third party neither your email address or any other data concerning you and your fleet. Sending of regular bulletins to resuming follow up if needed to owners or account administrators.